The pain women go through in the hands of some men can't be compared to the love some of them experience in their various matrimonial homes. 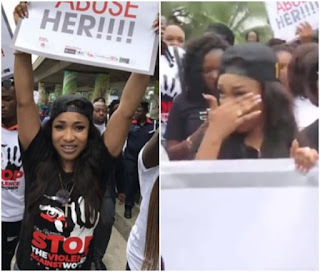 The fight against domestic violence has been on for some time now but recently got regonition when domestic violence rocked mercy aigbe's marriage followed by the dissolution of Tonto dikeh's marriage to Churchill. and sexual abuse against women across the continent was spotted during a recent rally crying bitterly as she took a walk round the city. Aww. Tonto is way too emotional. She really can’t control them as they come. Anger, misery, happiness, etc. She unleashes an avalanche of emotions. You didn’t create yourself my dear, you’ll be alright.